At the annual Student Activities Fair in White Plaza, a representative from the Cardinal Go Club explained the game. 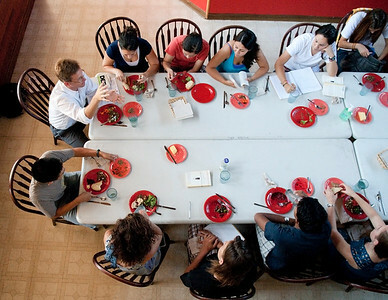 Associate professor of political science Rob Reich (seated at the end of the table in white shirt and glasses) and his students eat food they prepared for his Food and Politics course, part of Sophomore College. 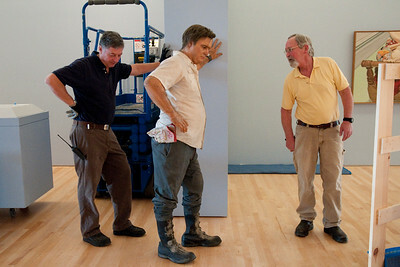 After the last adjustments are made, museum preparators Jeff Fairbairn and Frank Kommer give Duane Hanson's sculpture 'Slab Man' a final inspection. The Stanford Men's Swim team had their annual Speedo run through campus during Reunion Homecoming, stopping for a dip in Shumway Fountain. During the installation of Richard Serra's sculpture 'Sequence,' ironworker Domingo Tejeda wields a sledgehammer to move one of the panels into place. 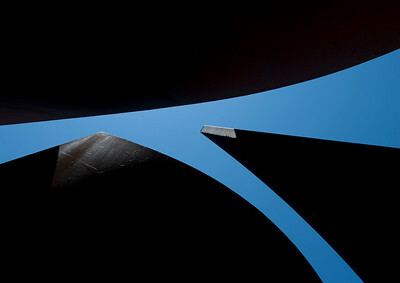 A view skyward from one of the intersections of steel in Richard Serra's sculpture 'Sequence' at the Cantor Arts Center. 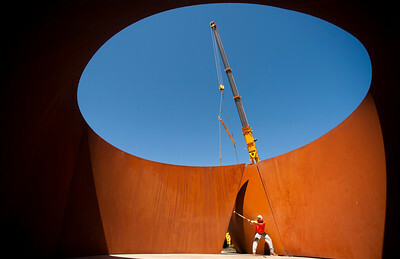 Installation of Richard Serra's sculpture “Sequence” was completed at the Cantor Arts Center at Stanford University. The sculpture measures 67 feet long, 42 feet wide, and 13 feet high, is composed of contoured steel and weighs more than 200 tons. 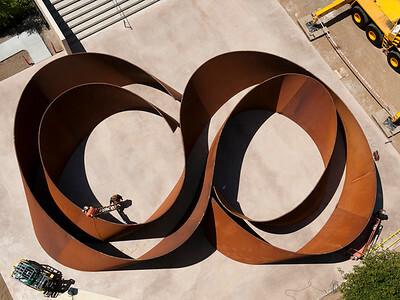 Considered one of Serra’s greatest achievements, the work will be on view outdoors for the first time since its creation in 2006. 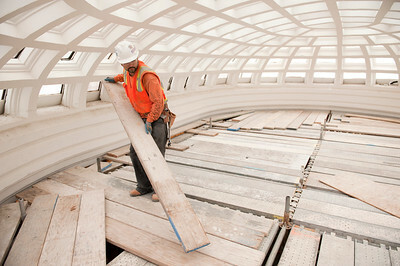 A worker places boards on the scaffolding that will be in place as the skylight restoration project begins at the Cantor Arts Center. 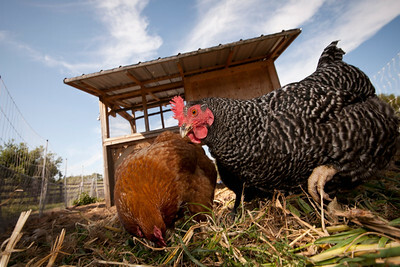 The farm's five chickens--Amelia, Sheriff, Odette, Ginkgo and Majesty--lay about 15 eggs each week, which are given to volunteers or sold at the Stanford Farm Stand, located in the Y2E2 courtyard on Fridays during the summer and fall. 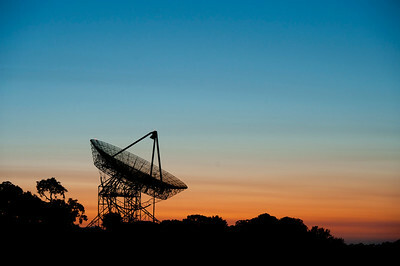 The Dish in the Stanford foothills at dusk. 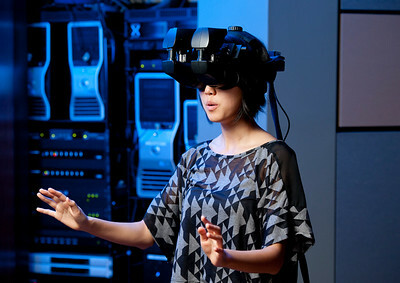 Sophomore Tina Roh experiences the virtual world that she helps to create as one of the lab programmers. 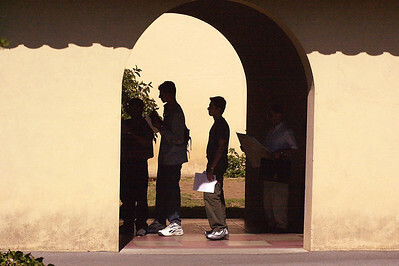 More than 200 pianos are available to be played on the Stanford campus. 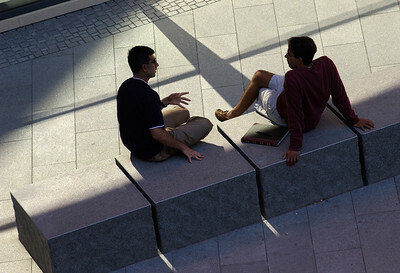 The Department of Music oversees their care and maintenance. 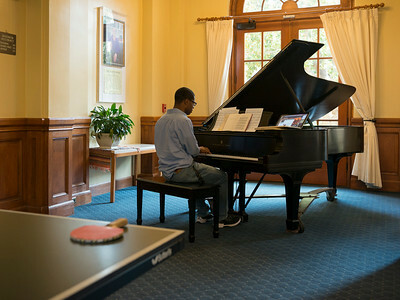 Junior Dewey Kemp practices preludes on a Steinway concert grand in the lounge of the Branner residence. Piano practice in the dorm practice room. 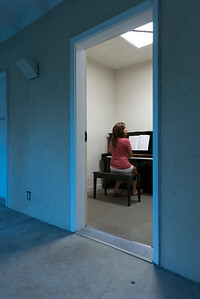 Senior Stephanie Webb, a classical piano performance major, uses the practice rooms in Rains Housing. Founder's Celebration 2012. 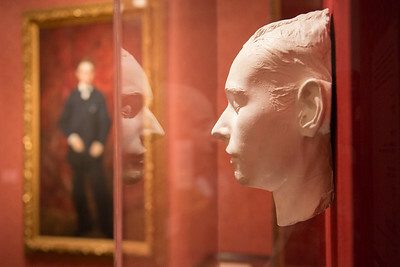 The Stanford Family Room includes a large portrait and death mask of Leland Stanford Jr.
All the Fisk-Nanney pipes are handmade (as are those of the Murray Harris) and range from the size of a pencil to 30 feet in length. The smaller the pipe, the higher the pitch. 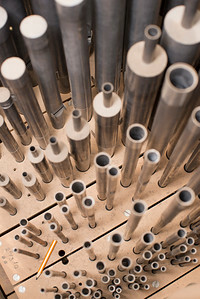 The vast majority of pipes are metal, but some are wood. 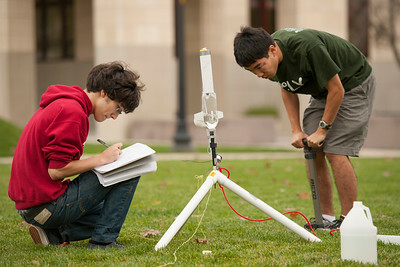 Freshmen Matthew Volk, left and Mark Nishimura launching compressed air rockets for their classical mechanics lab. On the first day of summer Junior Chaz Curet takes a break to read in the sun. 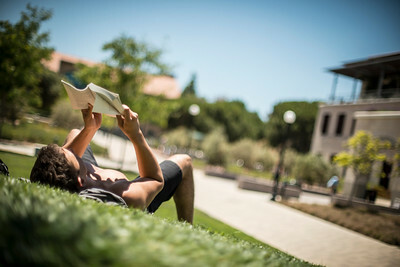 The english major found a comfortable spot in the SEQ to read from 'Our Story Begins,' a collection of short stories by Stanford Professor Tobias Wolff. Sophomore Kenneth Qin set up his vibes in a practice room where he meets with Kotche to work out some ideas about his composition. 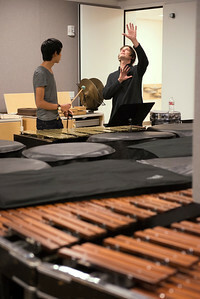 Percussionist Glenn Kotche of the band Wilco had a 2-day residency at Stanford where he met with a group of students who completed a composition and had a performance at the end. 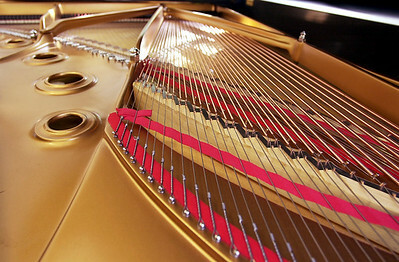 The piano at the Arrillaga Alumni Center. Graduate student Garrett Schlesinger gives The Chairman Truck a try on Tuesday afternoon. Food Trucks park on Lomita Mall during lunch hours. 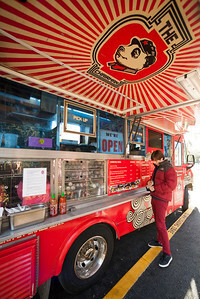 This truck, The Chairman, specializes in "food inspired by the original street food of Asia." 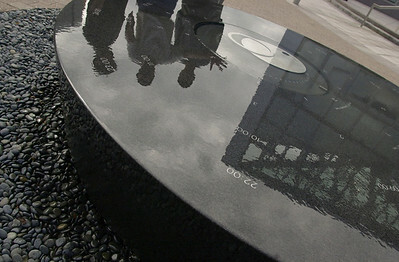 Timetable, sculpture by Maya Lin. 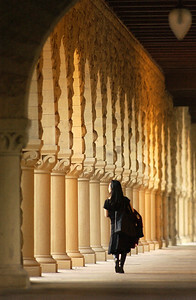 A student in the arcade of the main quad. 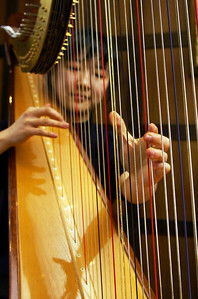 Kimberly Bento practiced the harp in the music room of the Overseas Studies Center in Berlin. 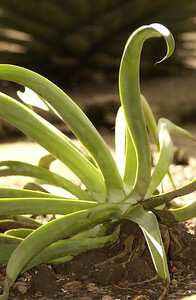 Octopus Agave (Agave vilmoriniana). 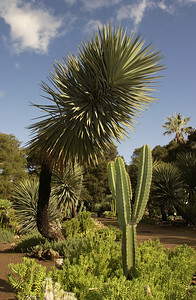 Arizona Garden in the Arboretum. Arizona Garden in the Arboretum. 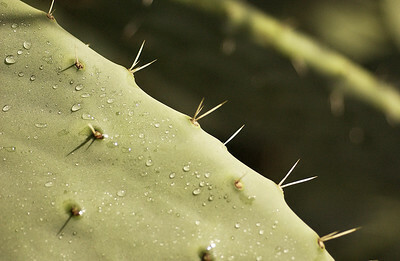 At rear: Schott Yucca (Yucca schottii): foreground: Cereus sp. 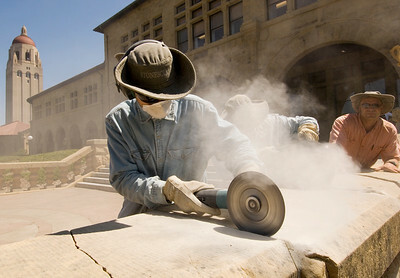 Stonesculpt employees Orion Lakota and Alfonso Arozco cut into the joints of the balustrade while Oleg Lobykin supervises. Lobykin is the owner of the firm that has been working to restore the sandstone perimeter. 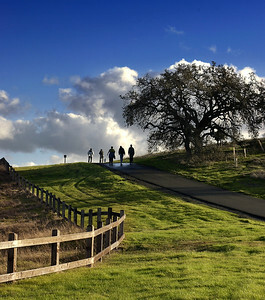 The stanford Canoe and Kayak team practiced on Lagunita on Monday February 3, 2003. 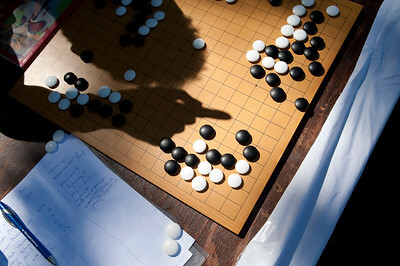 The team is the defending National Champion having won last year in it's first year of competition. 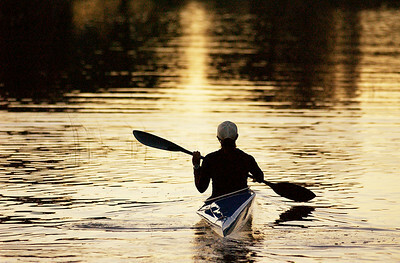 The kayaker in the white hat is sophomore Diana Ferrand. 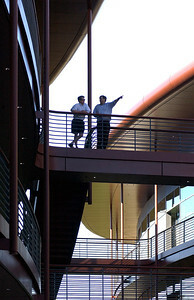 Clark Center dedication. 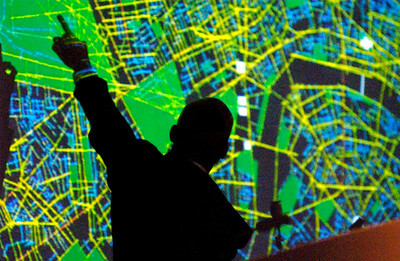 Sir Norman Foster, chief architect of the Clark Center, used maps and photographs during his talk in the center's main auditorium. Rachel Olney hammers a nail at the end of the workday. A team of Stanford engineering students is constructing a solar house that could ultimately serve as a model for the sustainable home building industry. The dwelling, dubbed Start.Home, is based on a revolutionary design that integrates most of the infrastructure required for a home in a centralized utility unit. 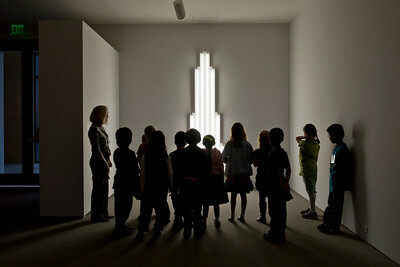 It will be unveiled at a solar home competition next fall in Southern California. Dorey Clayton walked Crispen, a Dutch Warmblood horse, through the Red Barn in the days just before the beginning of the $4 million renovation of the complex. Crispen lived at the barn for about 12 years, Clayton said.